If you have been on any vegan or raw vegan websites, you have undoubtedly seen the additions of “nutritional yeast” for recipes in the place of cheese or to use as a cheese flavor. As a child in Brazil, we used to put it on our popcorn and called it levedo. I had been searching for this yeast ever since coming to the US, and it was only after becoming vegan that I discovered people had long been using it for many recipes, and it was sold at any health food store. Turns out it had been under my nose the whole time, I just never could connect the Portuguese name to the English one.—A bit like how I couldn’t find the green vegetable cove in the US for years, until I realized its English name was collard greens…but I digress. 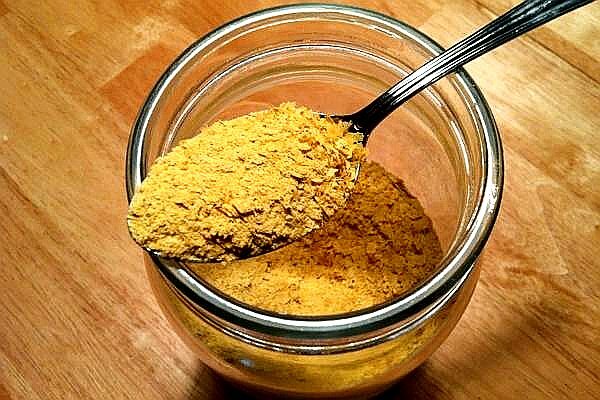 Not to be confused with brewer’s yeast or baker’s yeast, nutritional yeast is a deactivated yeast, and it is a vegan and raw vegan’s best friend. Packed with nutrients, it is high in protein and fortified with B12, so it is essential to a vegan diet. Plus…it tastes damn good! Along with B12, nutritional yeast is an excellent source of vitamin B1, vitamin B2, vitamin B3, vitamin B6 and folic acid. It is grown on enriched purified cane and beet molasses under carefully controlled conditions, but has no traces of simple sugars. Typically, a 1/4 cup serving of nutritional yeast contains about 45 calories, less than half a gram of fat, 3 grams of fiber, and 6 grams of protein, though exact nutritional value may vary by brand. Nutritional yeast can be used on anything from popcorn to soups to rice to sauces, spreads and salads! The options are limitless! While it may take some getting used to for some, I promise you that it is highly addicting! I grew up on the stuff so have always loved it. My favorite dishes are to use it as a cheese sauce for zucchini noodles or to use it in quinoa for a “cheesy rice” effect. Many of my recipes use it, and your life will be much improved with nutritional yeast in it, so give it a try, I promise you will love it! You can find nutritional yeast in jars in the bulk bin items or natural vitamins section of your health food store.